FREE or MONEYMAKER on Kiwi Products! Look what a new member of the Coupon Saving at Meijer shared with me! About 5 minutes after I added her she messaged me with this great deal! Thank's and welcome T Aurelia Tillbrooke! This week 5/10-5/16 buy ANY Kiwi product and get a $5 coupon to use on a future purchase! There are products starting at low as $3.29! That would be a $1.71 MONEYMAKER!! 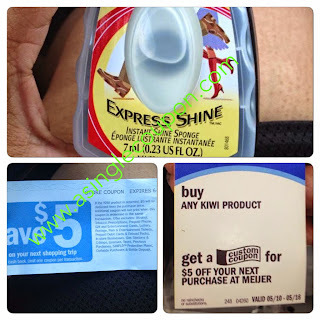 T Aurelia Tillbrooke bought the Kiwi Express Shine which was $4.99 (plus tax) and she got $5 back! I do love FREE! This seems like a lifetime ago. Glad I found your groups and have saved so much for my family. Thank you for all your hard work.